Nobody should sit down in the chair next to a tattoo artist without understanding that this very intimate sort of art involves a certain amount of pain. With that being said, there are steps you can take to minimize the amount of discomfort involved in getting your skin inked. Below you’ll find eight good ideas and tips for managing pain when you decide to take the plunge and get a tattoo. Tattoos and alcohol have a close relationship in popular culture. While it’s obviously a bad idea to make a serious decision about permanent body art when you’re sauced, it’s also not too smart to try and use alcohol as an anesthetic. Getting tattooed while drunk actually has the opposite effect. Because alcohol thins out your blood, it will make you bleed more during the tattooing process. It’s a good idea to top off with a hearty meal before you go to the tattoo parlor. A stomach full of food provides you with added stamina and makes it easier to manage the pain involved. If you’re on a restrictive diet, go ahead and mark down any tattooing day as a cheat day; you want as much glucose in your system as possible when you go under the needle. The tension involved in getting tattooed actually ramps up your metabolism and burns a lot of calories. You’ll need all the energy you can get. Drinking plenty of water is just good life advice in general, but it’s particularly important before you get a tattoo. You’ll be surprised to find out how subtle changes in your body chemistry can dramatically alter the tattooing experience. Just as alcohol or stimulants thin the blood and draw the process out, making sure your skin is well-hydrated improves ink absorption and speeds up tattooing. Start maximizing your water intake at least 12 hours prior to getting tattooed. As noted under the section on food, getting a tattoo burns up a surprising amount of energy. Make sure you get a full night of natural sleep before your session. This is particularly important with large pieces that are going to take several hours to complete. 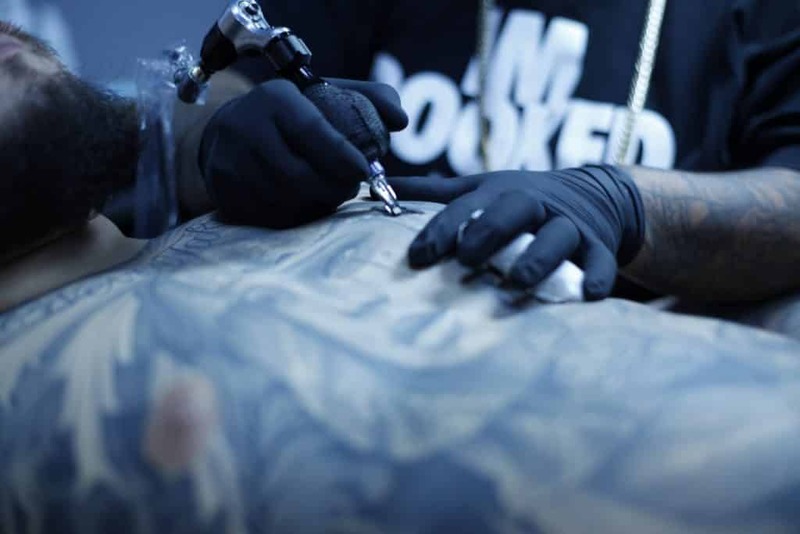 Your body will naturally try to block out the pain of tattooing by releasing adrenaline and endorphins, but it can’t do this if you’re exhausted and close to passing out. The tattoo pain may well grow intolerable if you obsess over it while it’s happening. Take a zen approach and focus your mind elsewhere. You don’t have to be a meditation master; concentrate on the music on the radio, the people talking in the waiting area, or anything else besides the tattooing process. Many enthusiasts swear by scheduling their tattoo sessions immediately after a yoga workout. It certainly doesn’t hurt to hit the parlor with a clear head, a loose body, and a focus on your breathing! This suggestion is similar to the last one, without the Zen bent. Talking to someone while your tattoo is being inked is a terrific distraction that can speed up the process and block the pain. You might find the perfect conversationalist in your tattoo artist; a lot of artists like to get to know their clients. If your artist is the less talkative sort, you should consider bringing a friend to talk to. Make sure you check with your tattoo artist in advance, though; a lot of parlors discourage crowding their working space with an audience. Certain sections of the skin are simply more sensitive than others. Serious tattoos applied to the chest, ribs, hands, or feet have a well-earned reputation for being exceptionally painful. Don’t be afraid to ask for a break if you need it. It’s a good idea to have a snack to pump those glucose levels back up. Don’t slip out of the zone any longer than you have to, though. Too many starts and stops will make your skin swell and slow down the work. You’ll also exhaust your body’s finite reserves of adrenaline. Fortunately, there are a few FDA-approved topical anesthetics specifically designed for tattooing. HUSH is one example of a multi-form anesthetic for tattoos; we have a numbing spray for tattoo, a foaming soap, or a numbing gel for tattoos. These anesthetics are great for pain management during and immediately after tattooing. Discuss anesthesia with your tattoo artist in advance. He or she may have strong opinions on the subject or be able to point you towards other options.